Home Food & Entertaining Food Caramelized Onion & Gorgonzola Steak Bites with Margaritas On The Rocks! Caramelized Onion & Gorgonzola Steak Bites with Margaritas On The Rocks! If you’re anything like me you love a good happy hour……I mean check out my name lol. I love going to different happy hours but I also love hosting my own at home. Trust me with this recipe and delicious wine happy hours at home with friends just got 10x better! This has to be the most delicious appetizer I’ve made in a really long time! If you love steak this ones for you. It’s my Caramelized Onion & Gorgonzola Steak Bites! They are super easy to make and your friends will love them! You may even want to make double just in case the first batch runs out too fast. I know from experience; I couldn’t wait to sink my teeth into those steak bites…..and my guest couldn’t wait either! lol. 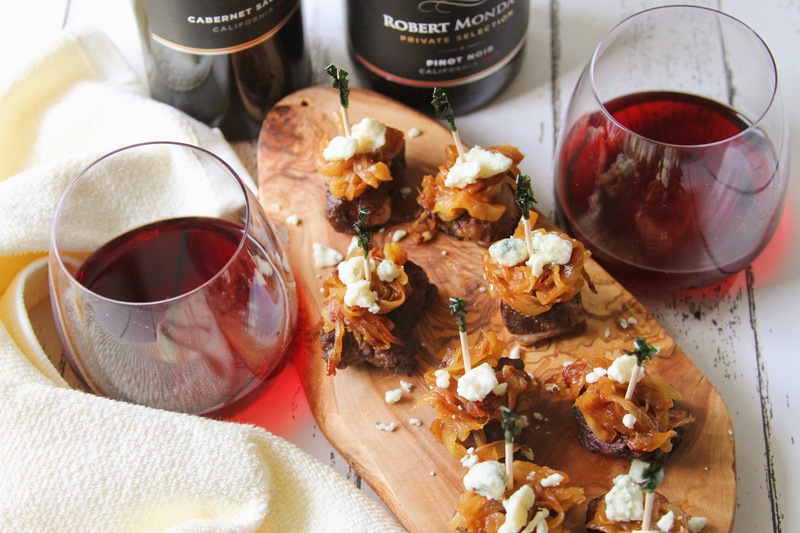 For this recipe I decided to pair my appetizer with two delicious reds by Robert Mondavi Private Selection! As I’m sure you know reds pair nicely with red meat so this pairing was a no brainer. The Robert Mondavi Private Selection Cabernet and Pinot Noir are perfection! My friends also loved the pairing too. Robert Mondavi’s is known for their extensive expertise in winemaking; they specialize in wines that can be enjoyed everyday by not only you but also friends and family. It’s the perfect accompany to dinner, date night, or at home appetizers. Robert Mondavi Private Selection’s new packaging is sleek and bold! I must say I enjoyed showcasing the bottles on my table; my friends instantly took to the high quality look and flavors of the wine. 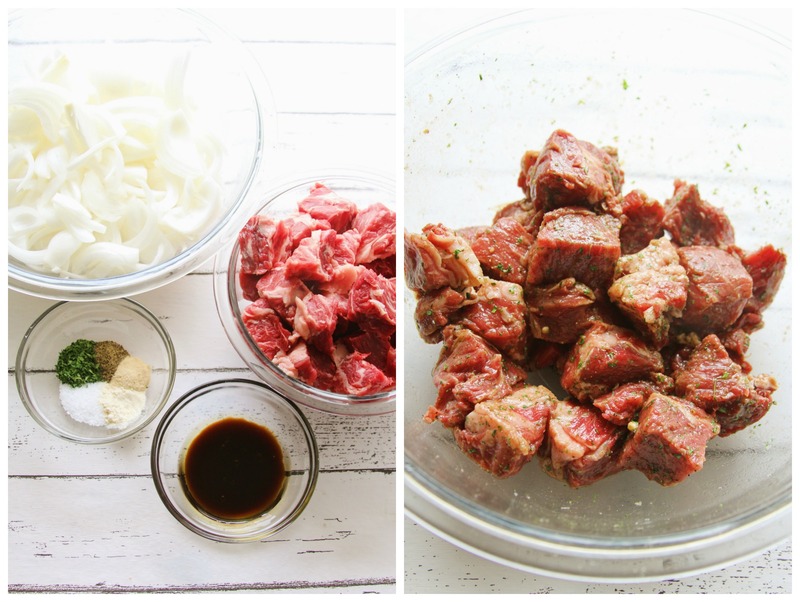 So I’m sure you’re wondering how to make these delicious steak bites….I promise its super easy! Lets get started. First things first we need to caramelize the onions. If you’ve never caramelized onions before it’s definitely a lengthy process….not hard it just takes patience. You want to start with about 5 or 6 white onions sliced. Once you get them all sliced throw them in a large heavy bottom skillet with 2 tbsp of butter and 1 tbsp of olive oil. It’s a process of allowing the onions to sit for about 4-5 minutes before stirring and turning over. Eventually you will go from the photo on the left to the photo on the right. Next we need to get our meat prepped! So I like to add seasoning to every layer of my dish so with this I made a mini marinade. The marinade consisted of parsley, onion powder, garlic powder, worcestershire sauce, olive oil, black pepper, and kosher salt. I had about 1-1.5lbs of ribeye that I cubed; add everything to a bowl and give it good toss. You can cover the bowl with plastic wrap and refrigerate for about 30 minutes. Next place your marinated steak bites on a baking sheet (I covered mines with foil for easy clean up) Now I decided to broil one batch and pan fry another just to test out both methods. Both work great it really depends on what you’re most comfortable with. If you chose the broil method it will literally only take a few minutes to cook on high heat….and the pan fry method takes about 5-10 minutes depending on the temperature you want. I prefer medium so mines took about 6 minutes total. You want to make sure to keep an eye on them either way so you don’t overcook them. 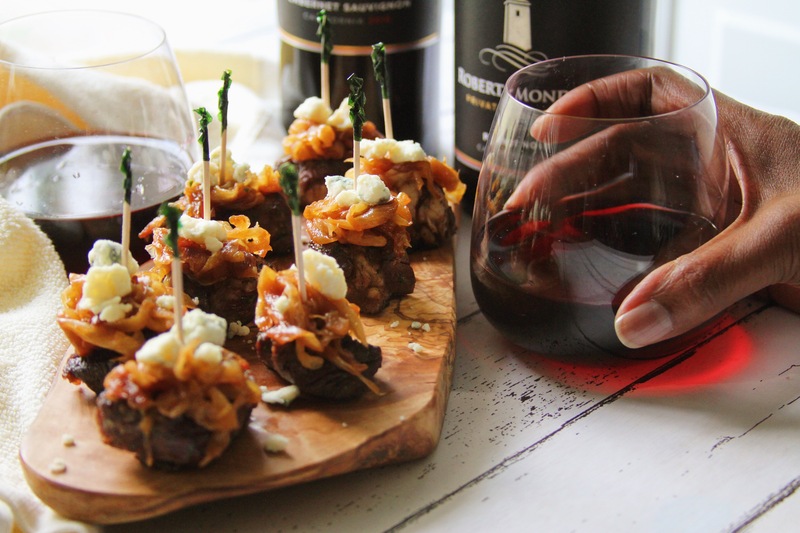 Once your meat is done grab you gorgonzola because its time to assemble these steak bites. Add a generous amount of caramelized onions, top it with the gorgonzola, and add a food pick to keep everything together. Place them on a nice platter and serve immediately. I do prefer the broil method because theres less clean up and you can get them cooked in a shorter amount of time at once versus cooking the steak bites in batches. And voila! See super easy appetizer to make your next at home happy hour super special and delicious! In a bowl add cubed steak bites, salt, parsley, black pepper, onion powder, garlic powder, worcestershire sauce, and olive oil. Give everything a good toss and cover with plastic wrap. Slice 5-6 white onions and set aside. Add butter and olive oil to a heavy bottom skillet and add sliced onions. Allow the onions to cook on high for about 3-4 minutes before reducing the heat to medium. Stir the onions every 5 minutes until completely caramelized. 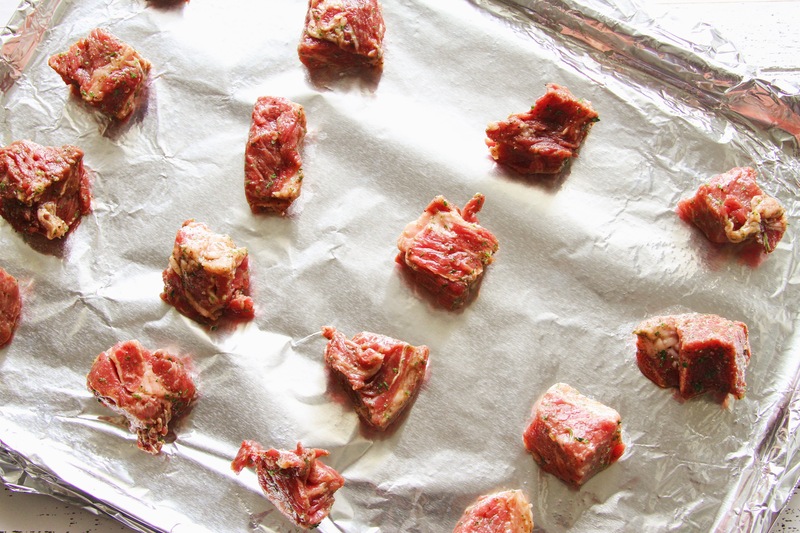 Remove marinated steak bites from the refrigerator and add to a baking sheet lined with foil. Place broiler on high and cook steak bites 1-2 minutes on each side (or more depending on temperature) before turning them over. This method cooks the steak bites pretty fast so make sure you are keeping a constant eye on them. Once cooked to your preferred temperature remove from oven. Add vegetable oil to a pan (about a tbsp) and allow to pan to heat. Add marinated steak bites to pan and cook 4-5 minutes on each side or until crust forms. Once done remove from heat and add the next batch. Place steak bits on a serving platter. 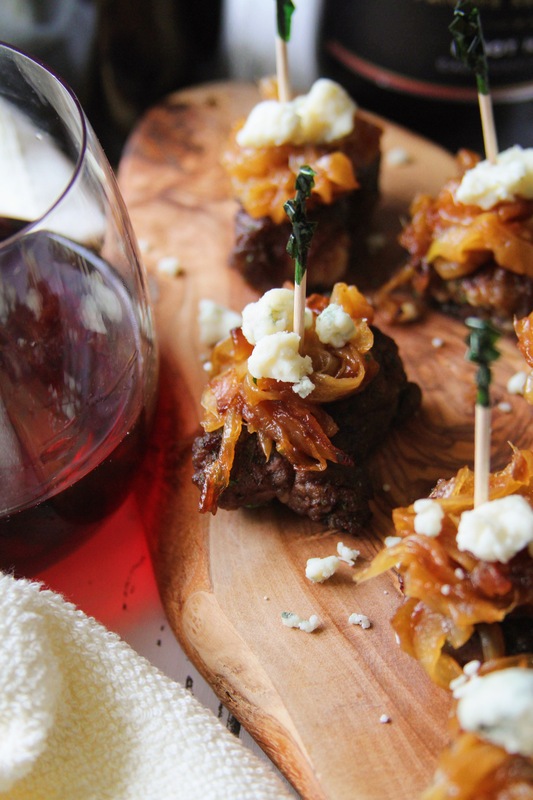 Add a heaping tablespoon of the caramelized onions onto the top of the steak bites. Add about a teaspoon or so of the gorgonzola cheese. Pierce with a cocktail pic or mini skewer. Written by Crystal Channing from www.margaritasontherocks.com Connect with Crystal by visiting her Instagram (https://www.instagram.com/margaritasontherocks/), Twitter (https://twitter.com/Margsontherock), or Facebook page (https://www.facebook.com/Margaritasontherocks/).